Assassin’s Creed Origins’ first expansion, The Hidden Ones, officially comes out on January 23. However, some players on Xbox One can already play the new content after the game was patched overnight. The Hidden Ones, the first of two major story DLCs currently announced, focuses on events set four years after the main game’s story and takes place in a new region, Sinai. It also raises the level cap to 45 while adding new outfits, mounts, and weapons. But while it’s not due out for another week, some players already managed to access it on Xbox One through the in-game store after the game’s latest patch rolled out earlier today. A picture one Xbox player took with their cellphone while in the new DLC area. Image credit: Winsdaddy via Reddit. 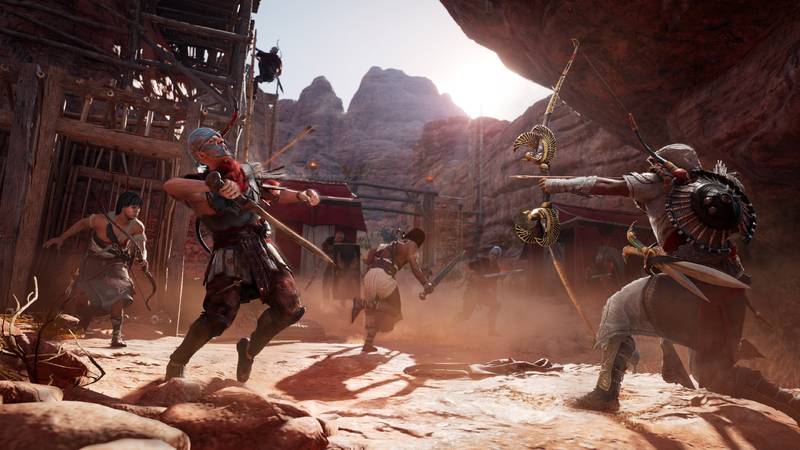 The post went on to say that Ubisoft will not remove access for players who have already downloaded the DLC and entered the new region in order to “avoid complications with save files.” While players who have access to Sinai will keep it, the post concludes by asking players to keep discussion of the expansion to spoiler-designated areas of the sub-forum. Details about the new story missions, items, and any interesting quirks about Sinai itself that distinguish it from the main game will likely continue to trickle out as players explore. One Reddit user who goes by Winsdaddy posted a picture of their assassin in one of the new outfits. Another posted some brief footage of themselves standing in the new area. It’s raised a small debate among the game’s community about how difficult it will be to avoid spoilers for another seven days.